We love meeting new patients and look forward to having you as a part of our orthodontics family! During your first visit, you’ll be greeted by one of our New Patient Coordinators who will help you get acquainted with our orthodontics office in either Asheville, Marion, or Rutherfordton, NC, and our terrific orthodontics team. Just as you want to get to know us, we also want to get to know you. We want to understand your goals and your concerns regarding braces and orthodontic treatment. Because we value your time, we have combined several appointments into this initial visit. To save time and get the most out of your initial consultation for orthodontics, please take a few minutes to fill out our New Patient Forms. You can print them out and bring them with you when you come to our Asheville orthodontics office. You should never have to choose between affordability and quality orthodontic care. That’s why TS Orthodontics offers low and no-interest financing options for braces and orthodontic treatment. We also accept Visa and MasterCard. You may have insurance coverage for orthodontics, so check your policy to see if insurance can help cover your investment in a confident smile. Additionally, you may have dental insurance benefits from your employer that cover a portion of your orthodontic treatment. While all orthodontic care is charged directly to the patient, we will help you claim your maximum benefit from your insurance carrier. While it’s never too late to get a TS Orthodontics Smile, we recommend that parents have their children examined by age 7. Having an evaluation while the child is still growing by leaps and bounds enables us to actually guide the growth of the jaw and position the teeth in the least invasive way. You can find out more on our ‘Orthodontic Treatment‘ page. Our options for teens are designed to get the best results at the best age. Most kids have all of their adult teeth around the age of 12. Crooked, crowded, misaligned teeth and jaw problems can all be addressed with orthodontic treatment during these adolescent years. Today’s kids see braces as a positive thing – a rite of passage. Many choose to accent their braces with brightly colored elastics and other things that help them show off their personality along with their braces! 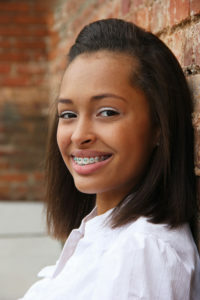 Other kids opt for less-visible options, like lingual braces or Invisalign Teen. We even offer braces that can help you achieve a straighter and healthier smile in half the time! To learn more, call 828.263.4514!